Acupuncture is a key component of traditional Chinese medicine, and practiced by some professionals such as those in the Acupuncture Association of Chartered Physiotherapists under the umbrella of evidence-based western medicine. While there are certainly many patients receptive to complementary and alternative therapies, the question for this hot topic is whether these therapies can or should be recommended within mainstream healthcare spaces for their effectiveness in treating acute substance use problems and disorders, or relieving symptoms of withdrawal. In medicine generally, whether acupuncture can be considered a bona fide treatment has been hotly contested. Cynical of the benefits of acupuncture, pharmacologist David Colquhoun and neurologist Steven Novella argued in 2013 that “the benefits of acupuncture [were] likely nonexistent, or at best … too small and too transient to be of any clinical significance”; and in what became the headline message of their editorial, that acupuncture may be “little or no more than a theatrical placebo”. This debate is also present within substance use treatment – when there is no accepted medication, and no specific psychosocial therapy for the particular problem presented by a client, one solution has been to offer complementary therapies, among which acupuncture (usually at sites in the ear) is by far the most widely used. A case in point is those dependent on cocaine, for whom acupuncture is a popular alternative, though in fact just about any psychosocial therapy helps some of these clients some of the time. It is also commonly used to ameliorate withdrawal symptoms from drugs including alcohol and heroin. However, the faith placed in acupuncture by services and patients appears contradicted by research, which generally finds that whether the needles are placed where they are supposed to be or at ‘sham’ sites (see box describing how acupuncture works) makes little or no difference. For example, in patients withdrawing from alcohol, nicotine or drugs, acupuncture was found no better at reducing withdrawal-associated anxiety than acupuncture needles inserted at sham sites, or a relaxing experience in the same setting as acupuncture was provided. In other words, if acupuncture does work, it seems it may not be working in the way it is supposed to (again, see box). Sympathetic – calms the nervous system and helps with overall relaxation. Shen Men / ‘Spirit Gate’ – reduces anxiety and nervousness. Kidney Point – for calming fears and healing internal organs. Liver Point – for detoxification, blood purification, and to quell aggression. 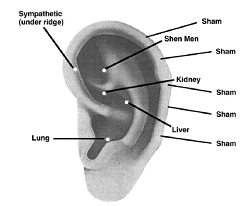 Traditionally, studies comparing ‘real’ versus sham acupuncture points (see image above right) have kept the other conditions of treatment the same, including the type of needle used – the only difference being where the needles are placed. More recently, other types of needles have been used for the control group, for example using a needle that “has a blunt tip and achieves no skin penetration”. When in 2011 the evidence for acupuncture in relation to alcohol treatment and withdrawal was reviewed for the UK’s National Institute for Health and Care Excellence, the verdict reached for this official advisory body was that conflicting evidence meant no recommendation could be made, except for more research. Currently, acupuncture is only a recommended treatment option for chronic tension-type headaches and migraines, though it is also used for treating other types of pain. More research too was called for in 2006 when the respected Cochrane collaboration published an assessment of whether acupuncture at sites on the ear has helped in the treatment of cocaine dependence. The unusually definite conclusion was, “There is currently no evidence that auricular acupuncture is effective for the treatment of cocaine dependence.” However, evidence was limited and from methodologically poor studies, so neither could it be said for sure that acupuncture was ineffective. More up-to-date reviews have yielded positive results, but the small number of studies on which they were based fundamentally limits the strength of the conclusions that can be drawn. This was the case with a meta-analysis combining the results of studies published up to August 2016. It found a significant difference in reductions of clinical symptoms such as craving and withdrawal between the acupuncture and control group in patients with alcohol use disorder, where the control groups were variously given placebo needles or sham acupuncture via needles inserted into nonspecific points, or a different type of intervention altogether (eg, relaxation or transdermal stimulation). Another review reported the potential for acupuncture to reduce alcohol craving and withdrawal symptoms (to a statistically significant degree), but this was based on only two studies (of the 15 randomised controlled trials assessed). Similarly, a 2018 review of non-human studies (involving rats) found evidence that acupuncture may effectively reduce alcohol consumption, reduce alcohol withdrawal syndrome, and rebalance neurotransmitters and hormones associated with cravings and consumption. However, the key consideration of this review was the application of acupuncture to alcohol use disorder, and it is questionable whether the conclusions could be extrapolated from rats to humans as rats cannot have what we understand as ‘alcohol use disorder’. Finally, a systematic review reported that results in favour of acupuncture for withdrawal/craving and anxiety symptoms are limited by low-quality bodies of evidence, and that overall, available evidence suggests no consistent differences between acupuncture and comparators for substance use. In the broader context of trying to support people experiencing problem drinking and drug use through their recovery, offering something concrete like acupuncture – even if in reality this is ‘only’ a placebo – may attract people to services, and, as some studies have suggested, help retain patients in treatment by engaging clients and staff in something they believe is worthwhile. If this is the case, acupuncture could indirectly improve outcomes by increasing the patient’s exposure to treatment’s active ingredients. These considerations may explain why despite no convincing evidence of efficacy (ie, how well something works under highly controlled conditions), acupuncture has featured in many of the treatment plans developed by local partnerships responsible for commissioning treatment services in England. It will take more and different kinds of studies to determine whether even if all they are buying is a possible placebo effect, it remains a worthwhile investment. Is there something valuable here which simply has not yet been proven to work due to few and sometimes methodologically weak studies, or is trying to find proof a dead end because the technique is simply ineffective? For the evidence to date run this hot topic search.